“Make him quite fat by all means. The last bushel, even if he sit as he eat, is the most profitable. If he can walk two hundred yards at a time, he is not well fatted. Lean bacon is the most wasteful thing that any family can use. In short, it is uneatable, except by drunkards, who want something to stimulate their sickly appetite. The man who cannot live on solid fat bacon, well fed and well cured, wants the sweet sauce of labour, or is fit for the hospital.” (p 109). 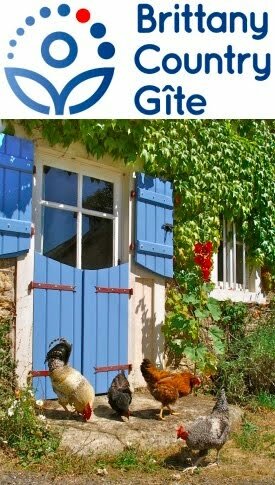 Last year, we overfed our pigs, a pair of New Zealand Kune Kunes, and Bernard, the boucher de campagne (itinerant slaughterman and butcher) who helped us out, called them “boules de graisse (balls of fat); well, at least William Cobbet would have approved. Kune Kunes are notorious for putting on fat, which was used by the Maoris to preserve food. 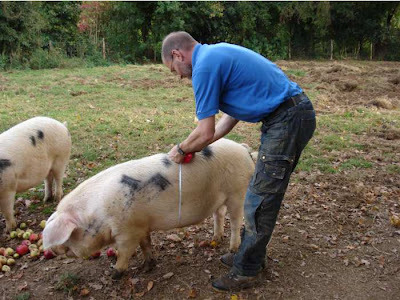 Similarly, other old breeds of pig will run to fat and so we’ve followed a regime this year, weighing out the food we give them each day; regularly prodding and poking and feeling for any sign of ribs, to try and remain in control of their size. The day is approaching and it’s time to have an idea of what weight they will “kill out” at (carcass weight), but how? Last year, wanting to know the weight of our pigs to work out how much medicine I needed to administer to worm them, I ended up standing on the bathroom scales holding a squealing pig, then subtracting my own weight. Gabrielle, more sensible and less foolhardy and always keen to avoid my back pinging out and rendering me immobile and bad-tempered for a few days, did some research and came up with a special pig tape. You measure them around their bellies and then read off the scale. See photo at top—though perhaps I should have asked Gabrielle to take a video to show you how I had to follow our pigs around as they grazed on apples, slightly annoyed, or perhaps just tickled, by my attempts. Good thing I didn’t try to pick them up, they’re supposedly 120 kgs (265 lbs) each! I'm not sure they're as heavy as the tape suggests. The tape must be reasonably (or, rather, unreasonably?) inaccurate, given that it's for all pigs. 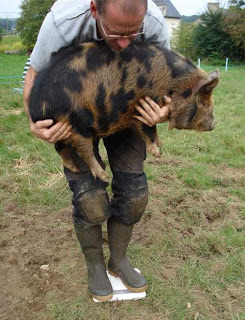 The girth to weight ratio of a Vietnamese Pot-Bellied pig has got to be a lot different to a lean modern farm pig. I'll report back on their true weight after they've been to the abattoir. They say most firemen will not eat pork... the smell of human flesh and pig flesh are indistinguishable. For health & heart - Go Vegan.